CarGurus has 17,842 nationwide Maxima listings starting at $1,995. If you don’t like the way the new Nissan Maxima looks, nothing about it will prove compelling enough to overrule your eyeballs. At this point, calling the Nissan Maxima a 4-door sports car seems like an outright lie. A BMW 335i is 4-door sports car. The Maxima? Not so much. But if you like the way this car looks, you’re probably going to like everything else about it. Raise your hand if you remember the Pontiac Grand Prix. I’m not talking about the cool ones from the 1960s and early '70s. I’m talking about the sedans on sale from the late 1980s until Pontiac was euthanized as a part of the guv’mint bailout of General Motors, the ones that relied primarily upon Rubbermaid body kits in order to generate excitement. Conceptually, the redesigned 2016 Nissan Maxima reminds me of those versions of the Grand Prix. Dynamically, the new Max is vastly better than any Grand Prix of the past four decades. Plus, the interior is terrific. But this still isn’t a 4-door sports car, no matter what Nissan tells you. With the arrival of a new Maxima, five versions are on sale, each equipped with specific features and offered with few extra-cost upgrades. Prices start at $33,235 for the Maxima S and top out at $43,660 for a Maxima Platinum with every factory-installed option. My test vehicle for the week was the Maxima SL, the mid-grade model, painted Storm Blue and featuring a Charcoal leather interior. Including its floor and trunk mat set, the price came to $37,935. In addition to the standard equipment for the Maxima SV—leather, heated front seats and side mirrors, front and rear parking sensors, an 8-way power driver’s seat with thigh support extension—the Maxima SL adds a number of safety technologies to the car. 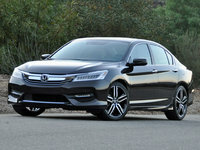 They include predictive forward-collision warning with automatic emergency braking, a blind-spot warning system with rear cross-traffic alert, and adaptive cruise control. Additionally, SL models include a dual-panel sunroof, a premium audio system, active noise cancellation and active sound enhancement, ambient cabin lighting, and a heated steering wheel. Note, too, that nearly all Maxima models are equipped with the same 18-inch aluminum wheels and exterior design details as my test vehicle, the exception being the sportier Maxima SR model. The Maxima SR is the closest thing to a 4-door sports car in the lineup and is priced from $38,495. It includes Maxima SL equipment, but ditches the panoramic sunroof to incrementally lower the car’s weight and center of gravity. Paddle shifters, a sport suspension, a front performance chassis damper, 19-inch wheels with lower profile tires, and an Integrated Dynamics Module (IDM) with Active Ride Control, Active Trace Control, and Active Engine Brake are exclusive to the Maxima SR. If you like the way the new Nissan Maxima looks, you’re probably going to like everything else about the car, enough so that you’ll park one in your driveway. If you don’t like the way the new Nissan Maxima looks, nothing about it will prove compelling enough to overrule your eyeballs. Nissan hopes you like what you see, because the company’s so-called “V-Motion” design cues are making their way across the company’s entire lineup of cars and crossovers. While the Maxima might ultimately represent an extreme manifestation of the company’s design direction, you should prepare yourself for a multitude of Nissans wearing a similar grille treatment, boomerang-shaped lighting elements, floating roof appearance, and unconventional styling details. While I’m not quite in agreement with where Nissan is heading as far as exterior styling is concerned, I love what they’ve done with the Maxima’s interior. The automaker says the car’s dashboard is modeled after those of fighter jets, with the center control panel angled 7 degrees toward the driver. My SL test car had metallic accent trim with a diamond-faceted surface, and it looked terrific. Additionally, for the most part, the interior materials match expectations set by the car’s price tag. Much of the switchgear exhibits a sense of heft and quality, and consistent surface detailing conveys a level of sophistication entirely appropriate for a vehicle positioned as a premium model. Don’t blame the Maxima’s engine for this car’s inability to truly deliver on the whole 4-door-sports-car premise. Making 300 horsepower at 6,400 rpm and 261 lb-ft of torque at 4,400 rpm, the 3.5-liter V6 engine is a genuine delight. Similar to the previous Maxima’s VQ-series V6, this latest iteration is 60 percent new, according to Nissan. The standard continuously variable transmission (CVT) isn’t at fault, either, though it sure doesn’t help the cause. This next-generation version of Nissan’s CVT employs dynamic step shifting and an adaptive shift controller, which means it is programmed to feel and sound more like a traditional automatic, cycling through “gears” as the car is driven. Instead, you can blame the fact that Nissan doesn’t offer an optional torque-vectoring all-wheel-drive system for the Maxima. Acura does. Audi does. Nissan doesn’t. It would make a huge difference in how the Maxima drives and lend credibility to the Maxima’s marketing message. What Nissan does offer is a Drive Mode Selector with Normal and Sport driving modes. Activate Sport to quicken throttle response, add heft to the steering, hasten the CVT’s stepped shift program, and enhance the exhaust note. No matter which mode is chosen, the 3.5-liter V6 provides robust power and sounds terrific from the driver’s seat. It's easy to get hooked on the power, as evidenced by my test average of 21.8 mpg, which falls just short of the EPA’s 22-mpg city driving rating, let alone the combined driving rating of 25 mpg. Under normal driving conditions, the Maxima’s CVT operates unobtrusively. Under moderate acceleration, or when launched from a stop under full throttle and in Sport mode, the CVT does a convincing impression of a traditional automatic. Just once during my testing did the transmission drone like a traditional CVT, and that was when I pulled out to pass slower traffic on a mountain grade. Feeling too heavy at lower speeds, and displaying a fairly wide turning radius, the Maxima features the best electric steering I’ve recently sampled from Nissan in terms of on-center feel and off-center response. 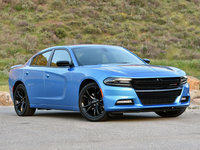 If the company could find a way to sharpen feel, and eliminate what sometimes feels like subtle episodes of torque steer, they’d be on to something. Engineers have done a good job with the Maxima’s brakes, too, which feel responsive, natural, and fade resistant. The ride quality also impresses, rougher patches of road expertly managed without excess impact harshness. Even at 80 mph, the Maxima’s cabin is quiet, making it easy to hold a conversation. Handling is commensurate with the expectations set by a front-drive car wearing all-season rubber. Happily, the Maxima’s transition to understeer is a gradual one and easy to manage, and I’m certain that the performance-tuned SR model proves unexpectedly talented on a twisty road. In the less-athletic SL trim, body roll, dive, and squat are evident but not off-putting, effectively keeping a driver’s enthusiasm better aligned with the car’s limits. While a Maxima still isn’t a 4-door sports car, no matter how much Nissan wishes it were true, it is an undeniably engaging sedan to drive. Previously, I asserted that the Maxima’s “interior materials match expectations set by the car’s price tag.” What I meant is that while some of the cabin’s parts look and feel inexpensive, like the plastic panel surrounding the power window and door lock switches, other materials exude enough quality to offset them. For example, the knobs and buttons on the center control panel exhibit the refinement of an Infiniti, and the Maxima’s soft-touch dashboard with exposed stitching, combined with the plush material atop the center console, succeed in their bids to give the car an upscale look and feel. 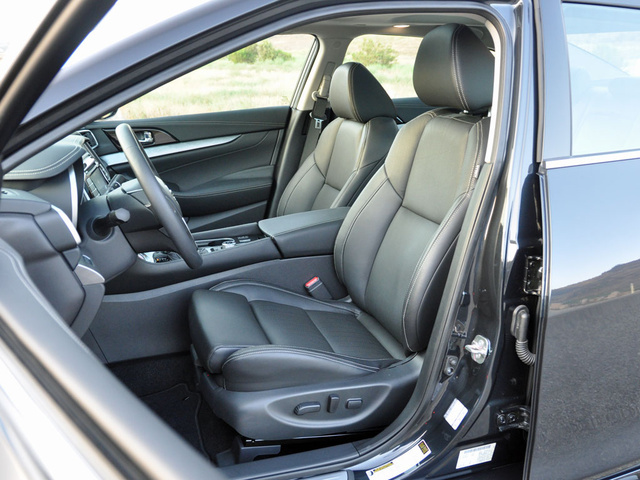 Plus, if you choose the Maxima SR or Maxima Platinum, you’ll get premium leather seats with diamond-quilted inserts. Comfort levels are high, unless you are the front-seat passenger and you dislike sitting on the floor. Seriously, I don’t understand why some automakers fail to include a seat-height adjuster for the front-seat passenger, especially on higher trim levels. Each of the adults I carried in the new Maxima commented on how low they were sitting, and each complained about how hard it was to get out of the Maxima. Granted, one could also argue that these people might wish to perform a sit-up or two every once in awhile, but still. Aside from this omission, the Maxima is very comfortable, thanks in part to its “Zero Gravity” seat designs, which are based upon NASA space exploration research and seek to deliver a feeling of weightlessness as a result of superior body support. Personally, I love Nissan’s Zero Gravity seats. The only thing that could have made me more comfortable would’ve been seat ventilation, which is reserved for the SR and Platinum trim levels. 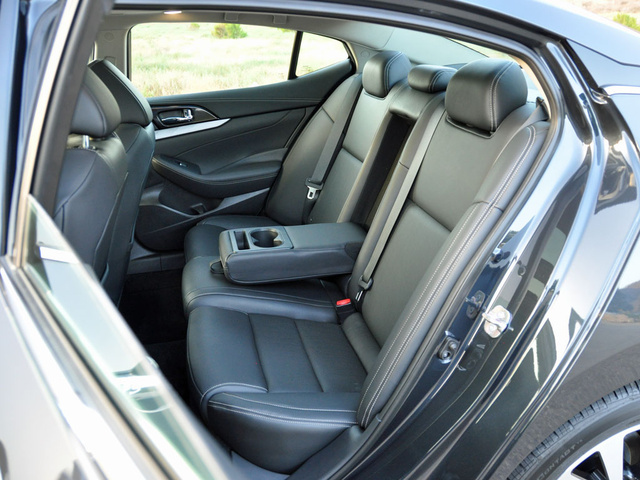 Although the Maxima’s rear-seat cushions are mounted low, they offer excellent thigh support, combined with decent levels of legroom and foot space. While not quite roomy, the midsize Maxima is comfortable enough that four adults should be happy. Given how comfortable the Maxima is, a road trip might be in order. You’ll need to pack light, though, because the trunk measures just 14.3 cubic feet, which is on the smaller side of the scale. At least there won’t be any shortage of entertainment while piling on the miles, though it is an unfortunate oversight to offer a USB port exclusively to front-seat occupants. With the debut of the 2016 Maxima, Nissan introduces a new version of its NissanConnect infotainment system, which includes a large 8-inch display screen and a variety of features and functions. Big, well-marked primary function buttons, as well as control knobs for the stereo, surround the screen, making it really easy to use the Maxima’s features. Some of these same features are accessed using the Display Commander located on the center console. I don’t understand this duplicity of controls, especially in light of the ergonomic mastery that is the Maxima’s dashboard. This leads me to believe that the Display Commander setup represents nothing more than an affectation designed to make the car seem more upscale. NissanConnect is standard for all versions of the 2016 Maxima, and the technology includes both a navigation system and new NissanConnect Services technology. 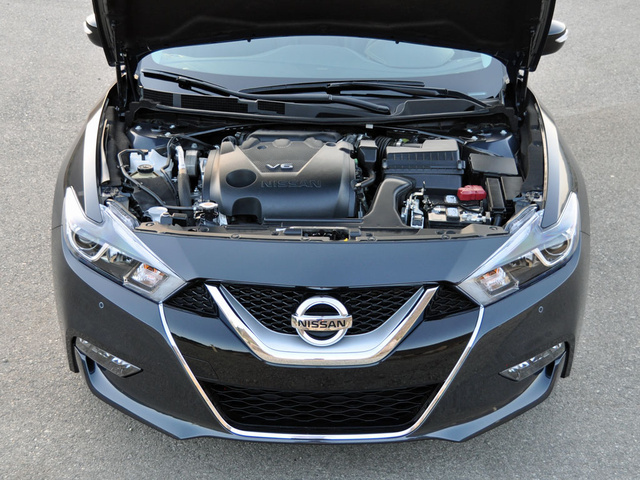 Debuting on the Maxima, NissanConnect Services provides access to speed, curfew and boundary alerts, remote engine start, and remote access to the car’s locks, lights, and horn. Additionally, this technology supplies automatic collision notification and emergency calling, a stolen-vehicle locator, connected and assisted search along with destination download capability, and Google Send to Car technology. Pairing up to NissanConnect is simple and easy, and the Maxima’s USB port is located in a deep bin forward of the shifter, one that's covered to help keep expensive smartphones out of sight when the car is parked. NissanConnect also includes a hands-free text-messaging assistant, enhancing overall safety levels. Nissan takes a measured approach to equipping the Maxima with safety features. A reversing camera is standard for all models, along with the aforementioned NissanConnect Services features that are related to safety. An Easy Fill Tire Alert system lets the driver know when a tire is in need of air and beeps the horn when the proper pressure is reached. Upgrade to the Maxima SL trim, like my test car, and you’ll get several important safety technologies. They include a blind-spot warning system with rear cross-traffic alert and a 360-degree monitoring system, along with what Nissan calls a predictive forward-collision warning system. The “predictive” part of that description stems from the system’s ability to monitor conditions two cars ahead of the Maxima, rather than simply relying on data gathered from the car immediately in front of the Nissan. When this technology senses that traffic is coming to a rapid stop, the car sounds a warning, and if the driver fails to take appropriate action, the Maxima’s forward emergency braking system automatically engages the brakes in order to lessen the severity of an impact. Nissan does not offer a lane-departure warning or lane-keeping assist system for the Maxima, which is just fine. This is supposed to be a driver’s car, after all. Unfortunately, a drowsy-driver detection system is reserved for the Maxima Platinum. How does the new Maxima protect occupants in a collision? That remains unclear, as neither the federal government nor the Insurance Institute for Highway Safety had conducted crash-test ratings at the time this review was written. However, Nissan boasts that the performance-tuned Maxima SR model’s torsional rigidity is greater than a Porsche Cayman's, so perhaps that reflects the company’s approach to meeting modern crash-test standards. If you buy a Maxima for its stated purpose, don’t expect to get anywhere near the official EPA fuel-economy estimates for the car. The EPA claims that the Maxima will return 22 mpg in the city, 30 on the highway, and 25 in combined driving. I averaged just 21.8 mpg. Don’t expect to get a great deal on a Maxima, either, at least not until Nissan has had a chance to measure consumer acceptance or rejection of the new design. Aside from a lease special for the Maxima S, the automaker was offering little in the way of incentives to buy the new Maxima at the end of the summer of 2015. How the new Maxima will retain its value over time is also somewhat of a mystery. The previous version of the Maxima was expected to hold its value at average levels, according to ALG. 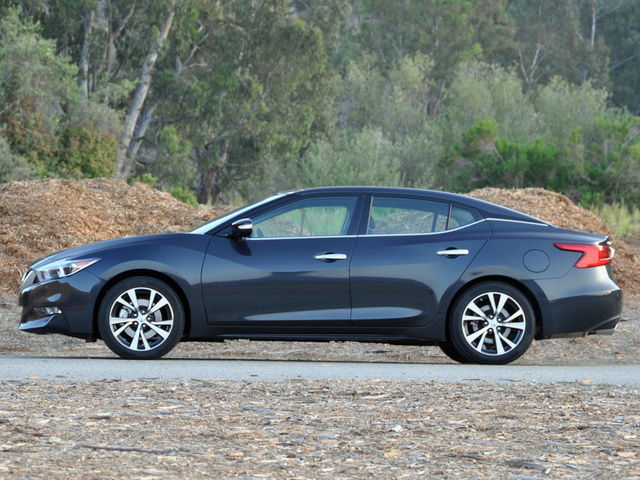 How well the new Maxima performs in this regard is yet to be determined. One thing Maxima buyers can likely rely upon is dependability. For the past decade, Maxima quality and reliability have impressed the car’s owners, and given that the new model adheres to the same basic formula, only the new technologies installed in the vehicle have the potential to alter course in terms of future ratings. As I stated early in this review, the new 2016 Nissan Maxima’s success or failure depends entirely on the styling. People who like the look will like the car. People who don’t like the look won’t be swayed by the interior, or the technology, or the performance. 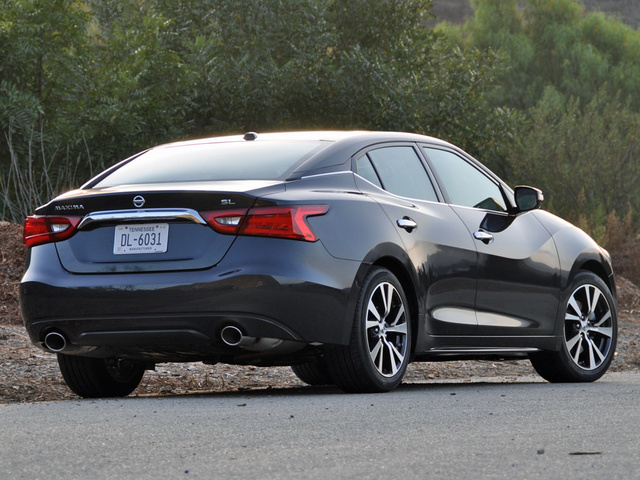 What's your take on the 2016 Nissan Maxima? 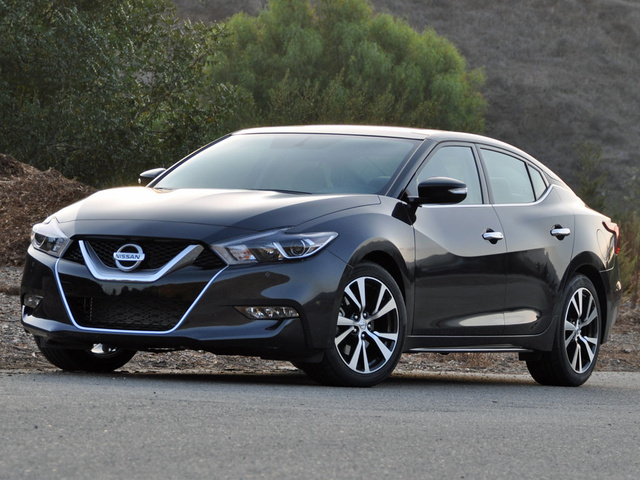 voltagefuel It's evident Mr. Wardlaw is not a fan of the Nissan product and he is entitled to his opinions - which is what is shared here, however several higher skilled automotive critics are providing more glowing reviews of the 2016 Maxima. Hidden from this review are obvious omissions the most amateur would not have missed, since this a "drivers car" and what you missed is the new Xtronic transmission, which, with its lack of fixed ratios, affords the specific advantage of always being in the right gear at the right time. A wider gear ratio range allows for stronger acceleration from a standing start and an all-new D-Step shifting logic allows rapid shifts at high throttle openings. An all-new shift logic holds rpm when it detects high-G cornering, allowing for seamless re-acceleration on corner exit. How Mr. Wardlaw could have missed the mention of D-Step baffles me. Mick The car in my opinion has an ugly side profile. I have a 2011 Maxima and I would not trade it for a 2016. The styling has turned me off to the Maxima. My next car is going to be the 2016 Chevrolet Camaro. GQue2010 I just purchased the 2016 Nissan Maxima about a month ago and I LOVE IT....it has more features than my 2012 BMW xi series and it is a dream to drive!! I was glad to trade in my BMW for this car! Props to Nissan!! billyt1129 Mr Wrdlaw is incorrect about the best electric steering being its still old fashioned hydraulic and I love the car for that. This is what gives it the balance and road feel the car needs. All you have to do is look under the hood and you will see the power steering fluid reservoir. I love the car but Nissan needs to step it up by offering AWD undoubtedly. I will lease or even but the next one if they offer that. Otherwise I may turn in my lease and pass. 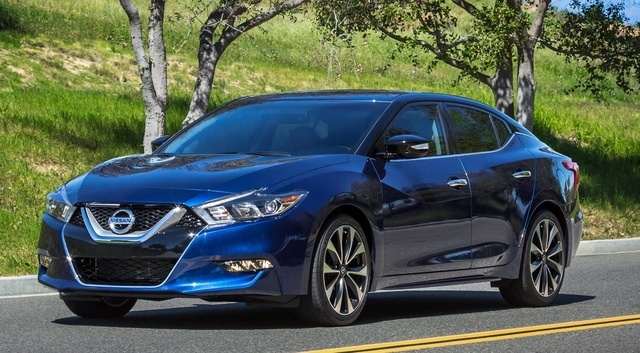 Have you driven a 2016 Nissan Maxima?